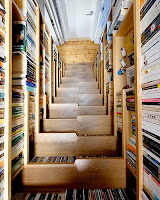 Now that's a stairbookcase! People would say that keeping titles in the cloud is so much neater, but you have to organize in any case, so that's not really a time saver. And, if you're not really organized or if you remember Susan Susanka's book under "Susan" or "Little" or "Big," how do you find it again without browsing and isn't browsing real books so much more fun? Moreover, guests to your home can't browse and see what you all have in common. And, with a printed bound book, you not only have access to the book, you have the book. You can lend it out, donate it, will it, gift it and more! 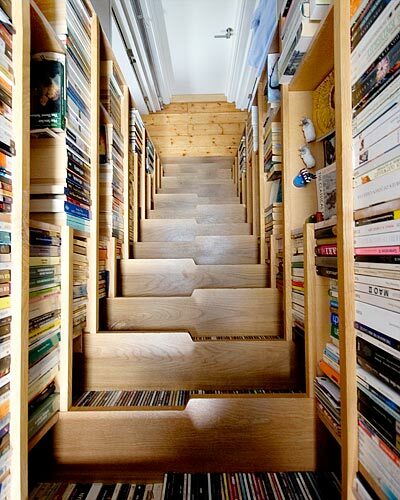 Best of all, to achieve this cool book/staircase, you don't need to buy a jobber's box of fusty old books like they do when displaying furniture for sale.